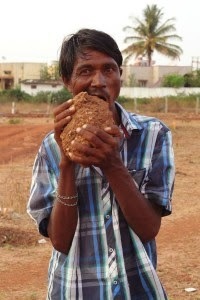 30-year-ol dIndian builder Pakkirappa Hunagundi, is addicted to eating bricks! he became hooked on devouring non-edible objects after first developing the acquired taste when he was 10-years-old. For 20 years he has consumed up to three kilos of debris a day, including mud and gravel, he finds lying around his village in Karnataka. But despite his strange eating disorder – thought to be caused by a condition called Pica – Pakkirappa insists he hasn’t suffered any ill-effects. And he wants to use his strange eating habits to make some money for his family by travelling across India showcasing his talents. 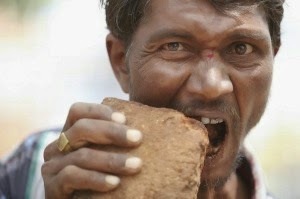 The oddball eater causally chews on freshly baked bricks he finds scattered around his village. And he uses nothing more than a glass of water to help digest the building material which he says tastes “A1″ – an Indian term meaning the best.